In May the Dodecahedron will be a decade old… and that has me in “holy crap, flashbacks!” mode. So I thought I should pull up a self-indulgent look-and-see of how my cartography has changed over the last nine years. I’m posting two maps from each year, one in June and one in December of that year, and focusing on dungeon maps primarily to keep the comparisons “fair”. That map at the top of 2009 was one of the very first I ever posted to the blog. It is painfully low-resolution and it turns out I can’t find the original anywhere, and don’t have any higher resolution scans of it around. I might even redraw it at some point. Much of the end of 2009 and 2010 was spent on my “Geomorph Mapping Project” to draw at least 100 interlocking geomorphs. 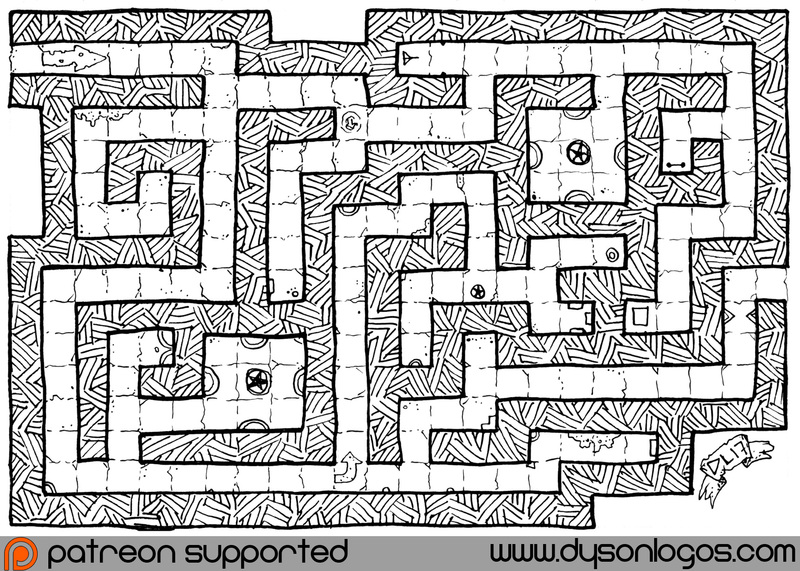 We closed out 2010 with Dyson’s Delve, my mini-mega-dungeon. In 2009 and 2010 I still use “pencil thin” walls – as you can see in the geomorphs and the Dyson’s Delve map. This is something I moved rapidly away from as I developed my style, and have only started sort of coming back to (using thick sharpie markers for walls) in the last year. These two maps from 2011 showcase my work as it locks into a definite style – avoiding single-stroke walls, adding more detail, and obviously a lot more comfortable with my work. The thick black walls and heavy hatching have become very clear by this point and many of the maps from this year are among my favourites of my older work. 2013 sees my maps pick up in quality and quantity again. The feel of the 2011 maps returns, with more time spent per map and a lot of effort put into presentation and structure. This is the year where I start transitioning away from generic black gel pens for my maps and towards using archival felt-tipped pens (Mistubishi Uni Pins and Sakura Microns mostly). More and more of my maps are now being drawn with a grid base – not usually shown on the map proper, but most of the maps in this era through to the end of 2015 are drawn on graph paper, making them easier to use with traditional VTTs and similar. 2014 and 2015 exemplify the style I had developed up to this point. I stabilize to a regular release schedule of maps twice a week. The style is consistent and easy to read. 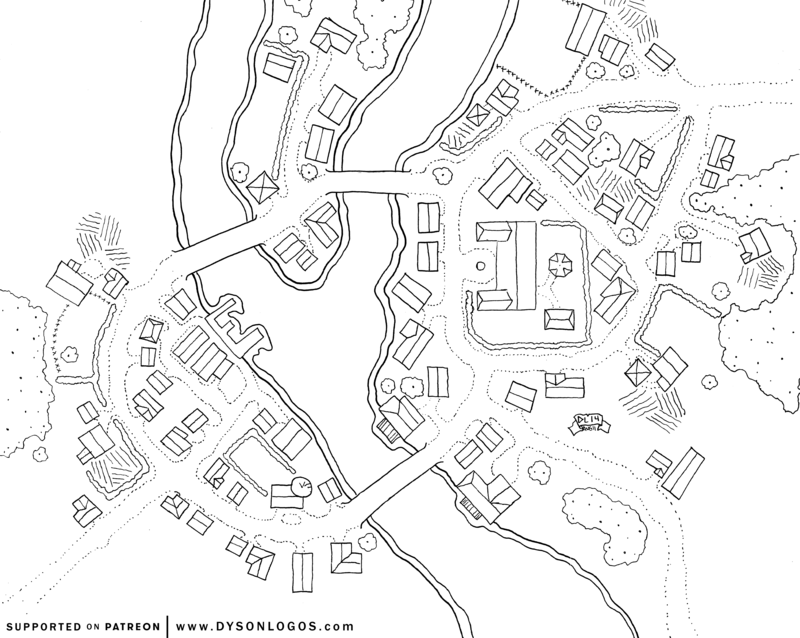 The winter of 2014 includes the release of the Dyson Megadelve, a massive megadungeon project that spans over 30 maps of caverns, dungeons, mines, and the ruins of a dwarven city. 2015 sees the lines for walls gradually getting darker and heavier, making the maps that little bit easier to read. 2015 sees another big stylistic transition in my maps. First I move away from drawing on graph paper, instead drawing on white paper with a sheet of graph paper behind it as a guide. 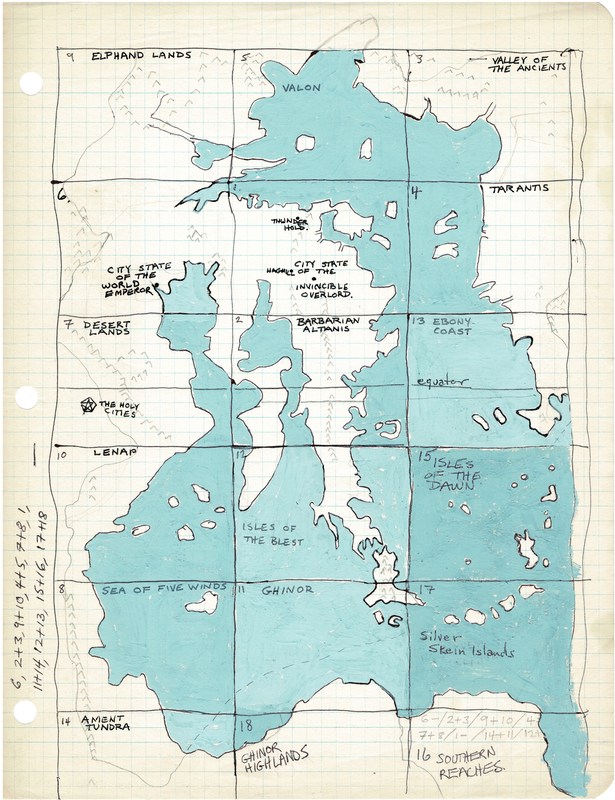 The black lines of my walls thicken yet again, and for a large number of maps I move away from a photoshopped grid to a hand-drawn one. The hand-drawn grid goes through several styles and iterations over the next few years. Some are better than others, and quite frankly some are disappointing when I look back on them now. Towards the end of the year I also transition from releasing maps as grayscale 300dpi JPG files to black and white 1200 dpi PNGs. My work this year included a lot of larger commercial projects in addition to my blog maps – and again my style grows and changes. I get into more fine details and in the fall of 2018 I started doing more work digitally after drawing the map in my traditional manner – I often add a bit of shade to the crosshatched areas now, and a fine shadow to help make the walls feel a bit more raised. As our “release the Kraken” map this month, I’ve combined two linked releases from 2015 and put them together into a single map. Welcome back to White Crag Fortress. No more than a generation ago did Hender, Warlord of the Two Realms, build the white fortress at the end of Merman’s Bluff. A small and fiercely held chunk of white granite looking over the dark and choppy seas where once the local fisherfolk made deals with the merpeople of the Octopus Kingdom. The fortress has never fallen, but has changed hands with the winds of politics and the changing fortunes of those who have tried to hold it. The current “castellan” of the fortress is a netherman (half-goblin) who uses it as part of his claim upon the title of Warlord – although none (even those who traded him the fortress) will acknowledge it. From White Crag Fortress he taxes the local farmers and fishermen lightly, but maintains an army of half-breed mercenaries that earns everyone’s distrust. White Crag Fortress is two discrete constructions – the Bailey Fort and the Spire. The Bailey Fort is separated from the mainland by a ditch dug into the spur of stone it is built into, with a permanent wooden bridge across leading into the main gatehouses. The Bailey Fort is a fairly large multi-story affair with a fairly large central courtyard. 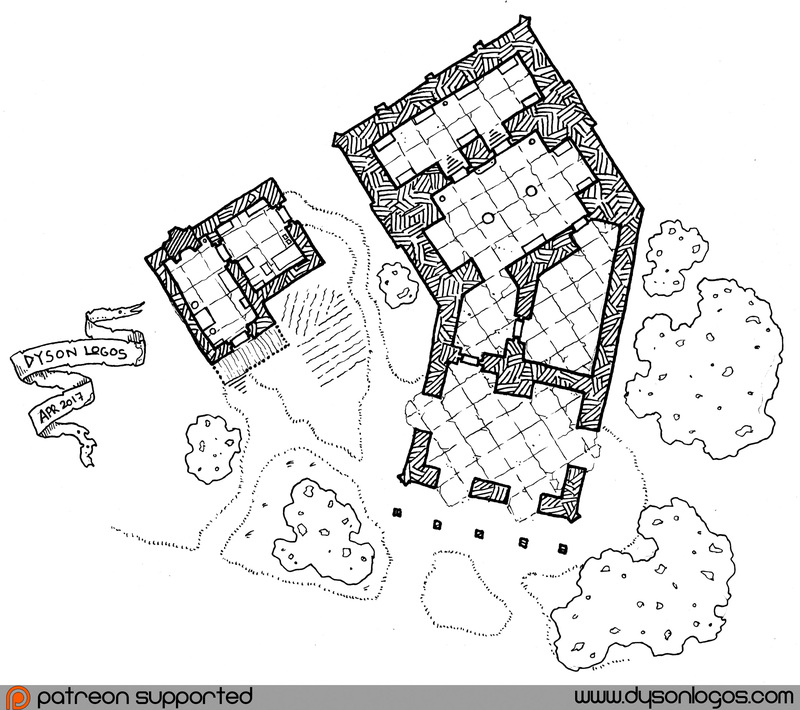 Should the fortress ever be owned by someone of wealth and means, this courtyard would likely be covered with a wooden structure turning it into another great hall with additional stories above it. The Spire looks out over the sea from the tip of Merman’s Bluff. Still made of the same white granite, it is a cramped and construction, restrained by the limited amount of land to work from. It is connected to the Bailey Fort via a stone bridge as well as a small tongue of rocky land that keeps the last part of the bluff from being a complete island. If one were to look directly down from the watch tower on the north side of the Bailey Fort, there is a cave leading into Merman’s Bluff with a small stone wharf connected to it. This postern gate to White Crag Fortress is intended to be well guarded, although the original door has been removed after it got stuck too often from rusting hinges and lock as well as swollen oak from the constant battering from the sea. In time it should be replaced by a properly oiled and tarred door, but for the time being the gateway remains open. The main level of the structures wind up under the structures of the Bailey Fort leading eventually to a trap door opening into the fort proper. These structures are used as storage, guard rooms, and an escape route in case of emergency. There is also a passage that leads up under the Spire, however it lacks an accessway into that structure (at one point there was such an access point, but a team of mechanical assassins used it to gain access to the spire and it was blocked off afterwards). This section contains a secret chamber that in turn has a trap door down to the lower chambers which are used as a secret dungeon for prisoners as well as an underwater escape route for those with the access and the means to travel underwater. The tunnel leading underwater from these lowest passages proceeds 130 feet further from Merman’s Bluff and into a small cave 20 feet under water. When activated through specific rituals “when the stars are right”, the three pillars of Ssa-Tun act as portals to anchor points in the Alabaster Hells. One of the three pillar-gates leads here, to a small cavern containing a lake of milky-white fluid. As with most things in the Alabaster Hells, everything here is not-quite-white in colour – from the pale grey walls to the heavy quartz pillars that seem to hold up the ceiling of the cave, to the milky-white liquid that seems to be slowly filling the cave. Guests here quickly discover that the pillar in the centre of the alabaster node doesn’t act as a return gate – and instead they must return through one of the four other gates that can be summoned. At the end of each row of quartz pillars a gate can be called with a quick ritual and splashing the milky waters on the inward faces of the two pillars in question. The ritual, fortunately, is inscribed on the walls of the hall to the “west”. The waters, unfortunately, are both toxic and strongly alkali. Along the blighted coast, beyond the lands of snow and ice and the adventurers’ boom-town of Gravelthorpe there is an old white stone pier on a quiet lonely shore. In the right seasons you can sometimes find the ruined road that leads into the hills from there and eventually to the valley of the Three Pillars of Ssa-Tun. The three pillars of Ssa-Tun are massive spires of marbled white and purple stone that reach up over a hundred feet from the ground and descend to unknown depths. Leading to these pillars are a few old ruins reduced to small mounds of rubble, and a much more intact set of ruins built up around the pillars themselves. In my efforts to level up my Four Against Darkness party to level 5 to try out the “Four Against the Abyss” book, I played what ended up being my shortest game to date at just under 20 minutes. 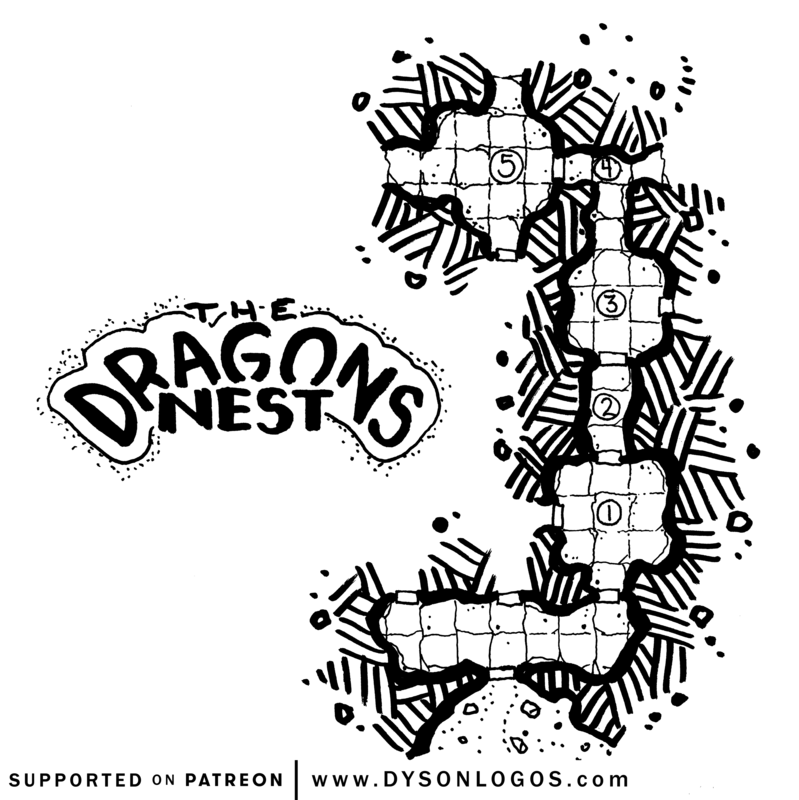 In the first room of the dungeon we ran into our first-ever dragon. As a level 6 boss monster, this would have been ruinous for a low level party. But right now our Barbarian is packing a +5 bonus in combat, the elf lays out a nice +3 (+4 with his bow), and the cleric and rogue are essentially there as meatshields / healers (the rogue’s high defense means he’s almost always the first thing that monsters attack). If anything, the dragon’s breath weapon is a welcome attack form, as it spreads its damage over the whole party, grants a saving throw of 3+ (2+ for the barbarian) and keeps the dragon from clawing at us. The battle ended up running for a few rounds as the barbarian beat the beast to death, with the rogue never landing a single blow. An encounter with a firebreathing chimera awaits us in the next hall, and then we meet the white lady who tasks us with a quest to bring back the next dragon we find… alive. And in the next room, we meet the Dragon. And this one is also the “boss monster” of the dungeon. This battle is a lot harder – we are fighting at -1 because we are trying to subdue the beast. This means the rogue needs to roll a 7+ to hit it, the cleric a 6+ (effectively the same thing), the Elf a 4+, and the Barbarian a 2+. And it has extra toughness. And an extra claw attack. And the alternate to beating it unconscious at -1 to attacks is to knock it out with a sleep spell… which dragons are immune to. The fight took many more rounds than I expected. I gave the boss dragon its extra claw attack even on rounds where it breathed fire, and neither the rogue nor the cleric ever landed a blow on the beast, leaving the battle to the elf and barbarian again. But the Barbarian’s Rage helped a lot, and the dragon was beaten bloody, thrown in a giant dragon-dragging-sack, and hauled back to the White Lady who rewarded us with The Book of Skalitos – a full spellbook for the elf that can be used as six individual scrolls, or to add spells to his spell selection. Plus dealing with a dragon as the final boss gives 2 XP rolls, and completing the quest for the white lady gave us another, bringing the Barbarian to level 5, and the rest of the party to level 3. The heat of summer is upon me – and just when I was hoping it was safe to get in the water, a kraken was released! 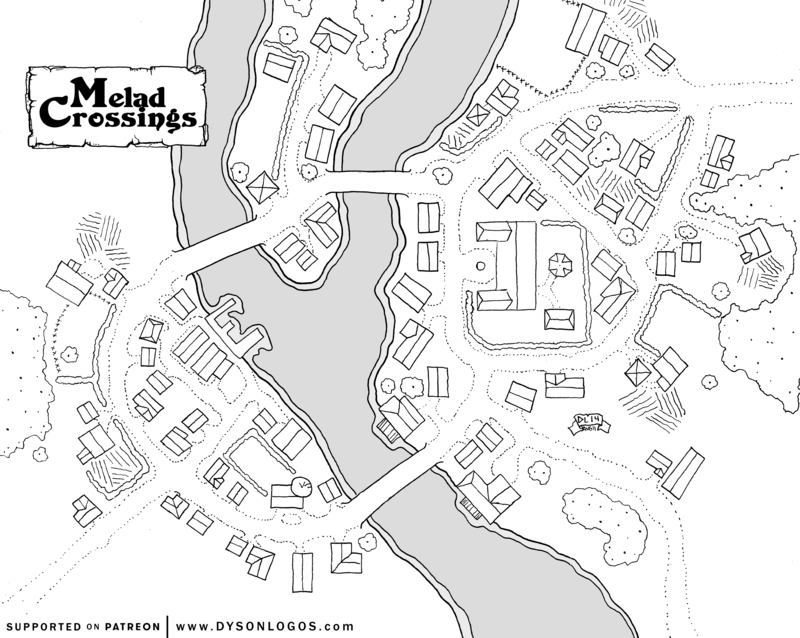 The first of the two maps being re-released under a commercial license is Melad Crossings, a small village map I drew in the summer of 2014. Foul things are afoot in the town of Melad Crossings. One of the two mills has stopped, the smell of death creeps by in the wind from many buildings, the streets are barren, and those who live are not likely to be out of doors except as is necessary. The water along the west fork of the river is running milky white, and none of the fishermen are among the living, struck dead two weeks ago just as the river began to change. But that doesn’t explain all the deaths – something else must be working it’s way through the townfolk… while the headsman says it is disease and begs for the church to send healers or paladins, others believe something far more sentient and sinister is behind the continued deaths. Or, you know, it could just be a pleasant little town for your adventuring party to chill out at en route to their next adventure. 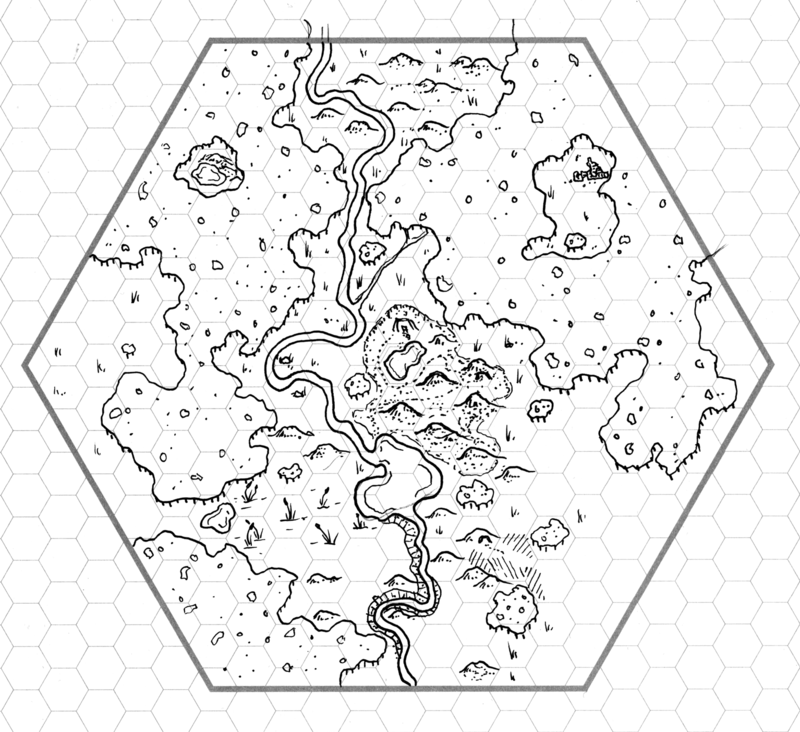 This post is one of a series presenting the hexmaps of Baraloba and the areas around it. You can see the rest of the set here: [Baraloba and Environs]. To the south of Baraloba are the Eagle Hills and the imaginatively named Eagle Hills River that runs through it from south to north before joining the Hewbank. The Eagle Hills have a mix of chalk and coal deposits that were attractive to miners. Most of the deposits have now been worked, leaving a collection of open mines and shaft mines in the area. 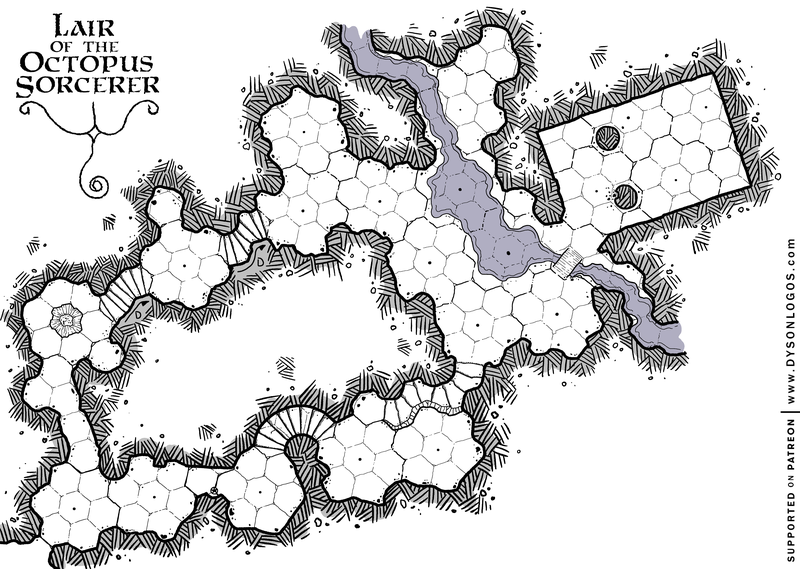 The central point of interest in this hex is the old open chalk mine that takes up 11 of the subhexes right in the middle of the map. The hills here are bright white and are a mix of natural hills and tailings from the mining operations. On the opposite side of the river and small lake from the mines is a boggy marshland slowly being reclaimed by the forest. If one were to dig beneath the immediate mud and water, it would be noted that the reason this area is low and doesn’t drain properly is that it too was an open mine at some point. Further south along the river is a small drift mine that has become home to a modest group of humanoids. They keep a low profile and farm the area around the minehead, using grain stolen from caravan a decade ago as their original seed stock. There are less than a score of them living here and they take significant pains to not be noticed by the residents of Baraloba only seven miles away. One of the wonderful things about buying used RPG stuff is finding artifacts left behind by other gamers. This was inside the cover of the City State of the Invincible Overlord book. The blue is lighter in person, and almost appears to be pale blue “white out” in consistency. Definitely a paint of some kind, and hand-mixed (thus the different shades from section to section). La version physique de cet ouvrage se présente sous la forme d’un livret de 36 Pages dans un folio de 4 pages servant de couverture. The patriarch of the cult of the White Archons retired to a tiny little thorp built up around a small bridge over an almost equally small river. He spent a small sum on fixing up the old church where he was first inducted into the order of the White Archons, and a significantly larger sum on a small tower on a hill overlooking the river and the thorp. The town took on his name and became Rosnar Hill and is growing ever-so-slowly. The central point in town, just west of the river and attached to the bridge, is the “new bridge inn” – a quiet and rustic establishment that serves decent lamb, fair beer, and an excellent imported red wine from the vinyards of Angel’s Dell. We’ll Take the Baby to the Goblin City! Between here and the goblin city is a great underground maze. Well, maybe that’s a bit of an exaggeration. But there’s a maze. And it is underground. And while most people entering it will be looking to get out the other end as soon as possible, there are chambers within the maze with their own hidden tricks, symbols, and messages. Violet Goblin – has scary-looking antlers. White Goblin – typical goblin but very, very pale. Lumpy Goblin – goblin is misshapen with massive nose, ears or other body parts. Explosive Goblin – this goblin explodes in a pressurized blast of harmless spores when slain. Frightening but harmless. Shrieking Goblin – screams very loudly when alarmed. Attracts other goblins to the scene of the action. Ascomoid Goblin – tucks himself into his heavy armour (+2 AC) and rolls down the caves, charging into his opponents at double normal speed. However, he must make a save versus paralysis after charging an opponent or spend the next round stunned. Basidirond Goblin – when killed, this goblin erupts into a 15′ radius cloud of spores that last for 1 round and cause confusion (DC 10 Con save to resist) for 1d6+1 rounds for anyone who contacts or breathes them during that round. Contagious Goblin – anyone wounded by this goblin must make a DC 10 Con save or become infected with a horrible fungal infection that deals 1d30 damage per day that cannot be healed until the infection is removed (via restoration). If the disease kills the victim, 1d4 shroom-goblins erupt from the corpse. Spotted Goblin – massive warts cover the goblin. Anyone touching the goblin (such as attacking with natural weapons) must make a DC 8 Con save or grow similar nasty warts. Cubic Goblin – roll 1d6 twice on this table. Absurd Goblin – roll 1d8 twice on this table. The Nuclear Option – treat as a cubic goblin, but explodes as contagious, spotted basidirond goblin. I have some pretty strong opinions about mazes and labyrinths in RPGs. (Hint: it involves not using a map – navigating a labyrinth is a mix of luck and skill, not cartography. Make appropriate skill checks, play it “theatre of the mind”, and include a few random locations to run into). HOWEVER, Since I drew one as an illustration before GenCon, I’ve had the bloody things running through my head lately, so I tried to exorcise it here. Pour faire rapide, je n’ai pas été franchement enthousiasmé. Skinner est un scénario d’enquête et d’horreur pour personnages de niveau moyen, dans lequel les héros vont affronter l’héritage du fondateur des Skin Dancers, Sam Haight. Les Skin Dancers sont des Parents qui ont créé un rituel maléfique afin de devenir des garous. Haight fut un ennemi rencontré dans plusieurs scénarios des premières éditions des jeux du Monde des Ténèbres, comme The Chaos Factor. Skinner est donc un clin d’oeil de l’auteur au passé de White Wolf. The Elderan Reliquary shares much with other mid-sized temples in the city, extending even to having a rectory for the wizard-sage Brondianix Serel Oje who maintains both structures and provides tours and information on the various relics and their origins to those interested. Unlike most reliquaries, however, the focus of this collection isn’t upon holy relics of martyred saints, ancient paladins and long-dead clerics, but bits and pieces of strange hardware and devices that were collected ages ago from the Temple of Iron and from areas around the Barrier Peaks. None of the relics are magical, but few of them are made from materials familiar to anyone who is not already a sage of the Temple of Iron – strange bone-like materials shaped into odd devices, panes of light leaded glass that do not shatter when dropped, and a bone-white device evidently meant to be hand-held along with a number of crystalline cubes that sit perfectly in a small depression on one side of it. Brondianix Serel Oje has explanations for what each item is, where it was found, and what it was believed to be used for. But much like a mermaid trying to explain the use of a common table fork, many of these documents and assertions are based on the bias of his predecessors and a complete lack of understanding of the people who built the Temple of Iron many ages ago. But if someone had come back from the Barrier Peaks with strange items that have run out of charges, the Elderan Reliquary would be one of the few places in the world likely to have a disc or two that would recharge the item, if only for a while.